Jose Abreu has arrived in the majors and, early on, he's fitting in nicely with the Chicago White Sox. 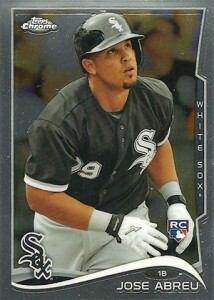 By the end of his first season in the Windy City, collectors will have plenty of Jose Abreu rookie cards to choose from. Even before signing with the Chicago White Sox, the Cuban slugger was lighting up the hobby with a handful of cards. He was included in 2013 Topps Tribute World Baseball Classic Edition, a highlight in a product that was largely overlooked. 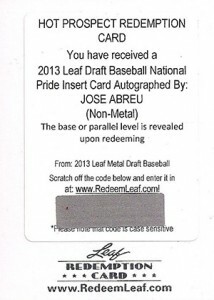 Leaf was the first company to have Jose Abreu autograph cards with redemptions in 2013 Leaf Metal Draft. Redeemed copies are now available. Leaf also has additional autographs in 2013 Leaf Memories and 2013 Leaf Trinity. 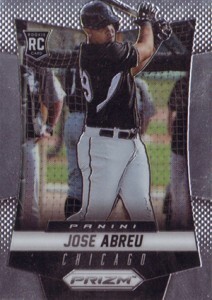 Panini also got an early Jose Abreu autograph in 2013 Panini Prizm Perennial Draft Picks. It is worth noting that while these cards were the first on the market, most don't consider them to be rookies as they're from prospect-only sets. 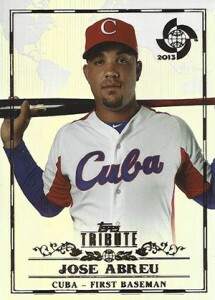 In the case of Topps Tribute WBC, it's viewed as an international set. That said, don't discount their overall importance. We're in an era where the rookie card label doesn't always coincide with a player's best card. 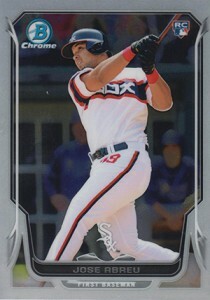 The first Jose Abreu rookie card with the Cuban slugger in his White Sox uniform was included in 2014 Topps Gypsy Queen. Panini quickly followed suit with a wrapper redemption card from 2014 Donruss. 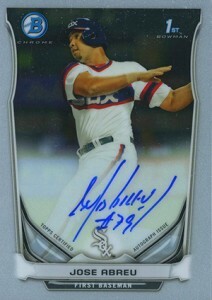 Collectors will find Jose Abreu autographs in 2014 products as well. Topps has announced they've got a deal in place with the outfielder. This includes a mystery redemption in 2014 Topps Tribute and a Prospect Autograph in 2014 Bowman Baseball. Please note that this list is a work in progress. We'll update it as new Jose Abreu rookie cards are released. Click on the card names to shop for singles on eBay. 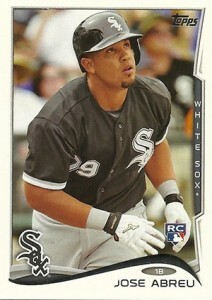 This Jose Abreu rookie card falls on the cheaper side. While he appeared in 2014 Bowman, both his paper and Chrome cards in the set were part of the Prospect inserts. Therefore, they technically aren't rookies (even if most view them as such). Besides the regular card, there are several Refractor parallels. It has some major shine, but Bowman Platinum base cards are very much on the affordable side. This is a nice choice for collectors on a budget who want something that looks modern. You won't find this card in packs. It is part of a wrapper redemption offered by Panini. With just 24 packs (one box) required to get the three-card Rated Rookies updates, it shouldn't be too tough to find over the long term. 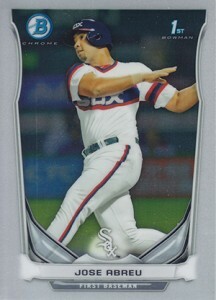 Jose Abreu has a pair of cards in 2014 Panini Immaculate Baseball that could be considered rookies. The first (#154) is numbered to 49 and comes with both an autograph and a memorabilia swatch. A parallel, numbered to 99, has a patch. The second rookie card is #155 and it just has a swatch. This one is more plentiful with 99 copies. While the base version of this card is inexpensive, there are ten parallels to keep dedicated collectors busy. 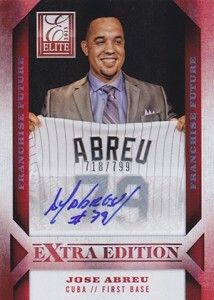 On top of that, Abreu appears in many of Prizm's insert sets (and their plentiful parallels) and has autographs. 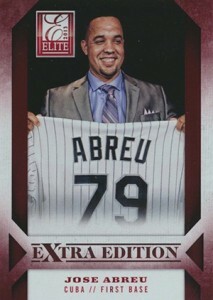 Neither high-end or a short print, this is bound to be one of Abreu's most affordable rookies. That said, given Topps' habits of revisiting rookies, this will likely be one that's seen more often than a lot of others. 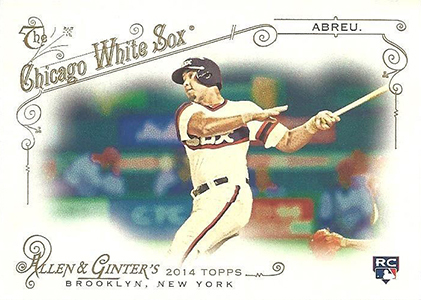 If you're looking for a beautiful Jose Abreu rookie card that doesn't have any frills, it doesn't get much better than 2014 Topps Allen & Ginter. Part of the base set, it's not a short print so prices should stay relatively low. A lot of this card's modest value comes from the fact that it's a short print. Although not terribly tough to track down, single-card buyers have competition from set builders. The design is inspired by 1986 Topps Baseball. Abreu is also included on the set's Fan Favorites Autographs checklist. Sticking with tradition, 2014 Topps Chrome offers a chromium spin on the base card. It's not a particularly valuable card as it's not a short print. Besides a large Refractor rainbow, there's also an autographed insert (with its own set of Refractors). This card is a wild and colorful departure from Topps' other chromium-based releases. Collectors seem to be mixed on the look. Either way, it's an affordable card and there's no reason why it should carry a premium. While his base rookie card isn't very valuable, his autograph is. It's one of the top cards in the entire product. 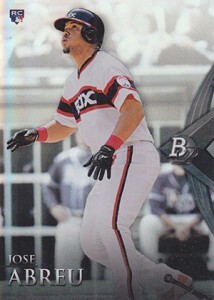 This card carries carries the distinction of being the first Jose Abreu card to picture him in a White Sox uniform. It is a short print, but it shouldn't be considered rare. 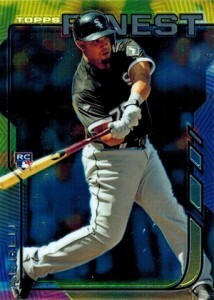 Jose Abreu also has a Reverse Image variation in the set. The mini parallels also have their own photo variation. A shrunken down version of his flagship Topps card, 2014 Topps Mini has the novelty of being an online exclusive. As a result, the print run is significantly smaller and it should carry a moderately bigger price tag. 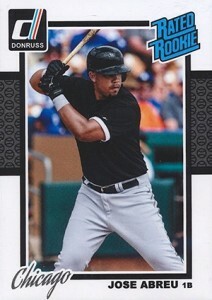 Between the elegant look and the high-end product it comes from, this is one of the best basic Jose Abreu rookie cards. It's not serial numbered so the price is kept in check. However, looking for it in packs can get expensive in a hurry since boxes don't have a lot of base cards. 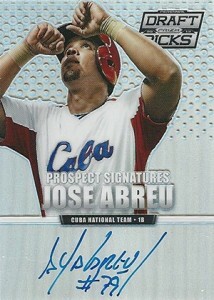 The 2013 Leaf Memories Jose Abreu autograph uses the 1960 Leaf design. The black-and-white photo is a major contrast from his other early cards. Besides the basic version, there are a handful of color-based parallels. 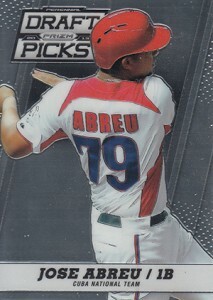 2013 Leaf Metal Draft released shortly before Abreu signed with the White Sox. Although the redemption is inserted in a chromium-style product, the final card isn't. It's a special edition National Pride autograph. Like most Leaf redemptions, it doesn't mention whether it's the base version or a parallel. That's revealed once it's redeemed. All of the 2013 Leaf Trinity Jose Abreu autographs come with an inscription, which makes it a standout among the slugger's first cards. The base version is limited to 30 numbered copies, however there are a handful of rarer parallels. 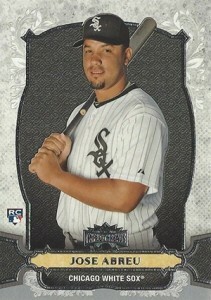 Although Abreu isn't wearing a White Sox uniform, he is holding one here. 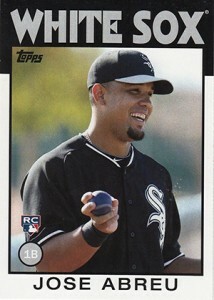 If you're looking for a reasonably priced Jose Abreu card, this is it. Besides the basic version, there are a lot of parallels to chase. Numbered to 799, this isn't a terribly rare card. There's a bit of a tradeoff. It should keep prices a lot more reasonable, which is a good thing for those on a tighter budget. It also keeps supply a little more plentiful. 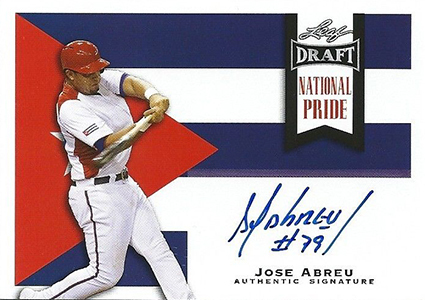 The signature is on a sticker, the only 2013 Jose Abreu to do so. Like the Elite Extra Edition card, this one is very affordable. If you're looking for something more valuable, the Prizm parallels add some rainbow flair. 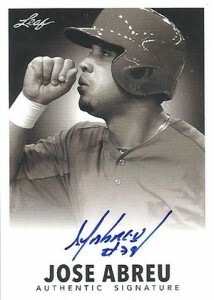 This card uses a much better photo than Abreu's base card. The on-card signature is the big star, though. Besides a basic version, there is a handful of colorful Prizm parallels. Many collectors will treat this as a rookie. It did come out after his first rookies. Abreu is also in a White Sox jersey. However, it's numbered as part of the Prospects portion of the set so, technically, it's an insert. But that's just a label and it really doesn't take away from its popularity. 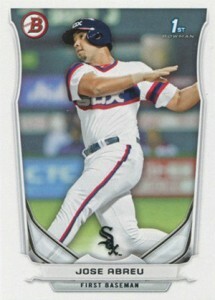 As more cards hit the market, this will be one of the more affordable Abreu first-year cards. Like the basic Bowman card, this is technically an insert. It comes with a slightly more premium look and feel. Although it's a Bowman Chrome card, it's found in 2014 Bowman Baseball packs. 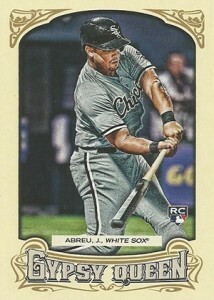 Also found in 2014 Bowman Baseball, this will be one of the top Jose Abreu cards even if it's not an official rookie. It's an insert, but Bowman Chrome Autographs have, in many ways, become the modern equivalent of a baseball rookie card -- at least the way they're traded and coveted. Besides the basic version, it has lots of colorful parallels including a one-of-one Superfractor. Jose just finished a signing a few weeks ago at Sidsgraphs in Chicago. We will as new sets are released. This guy is either a strike out or a home run. More likely a K. There a reason he was signed by the Sox, the big spenders know something we don’t. Don’t over pay for this one.